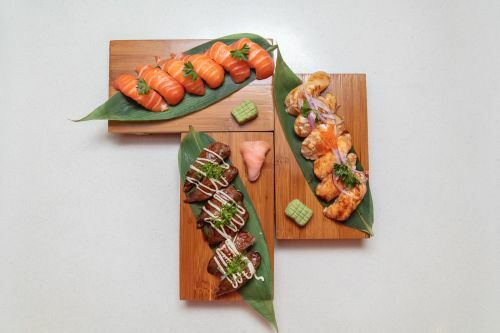 Menulog delivers for Season Sushi so you'll be able to track your courier on a map. 3 x Tempura Prawns, 4 x Tempura Prawn Nigiri and 4 x Tempura Pumpkin. Salmon with choice of crab stick, lobster salad, seaweed salad or scallop. Tomago, cucumber and choice of chicken, tuna or salmon. Crab stick, salad, cucumber and fish roe. Sliced salmon, avocado and crab salad. Assorted vegetables and fried bean curd. Choice of crab stick, chicken or salmon. Raw salmon, avocado and onion. Raw salmon, cook prawn, avocado and cucumber. Raw salmon, cooked tuna, avocado and orange. Sliced cheese and chicken schnitzel. Seafood salad, cooked tuna and cheese. Grilled salmon, cooked tuna and cheese sauce. Cream cheese, fried crumbed prawn, cucumber and avocado. With one Miso Soup. Contain with egg. Fried crumbed chicken, egg and rice served with Miso Soup and salad. Marinated eel and rice served with Miso Soup and salad. Mixed vegetable and mushroom soup. Mixed seafood soup (mussel, prawn, calamari, salmon and seaweed).